A highly detailed and vividly colored graffiti monster in Hosier Lane, Melbourne. I believe I’ve owned around 25 camera kits over the years. My current camera is the Sony a7R II mirrorless camera. It's been a godsend. It took me quite a while to get my head around the variety of options for still photography within the camera's various menus, not to mention it's ability for customization. The good news is that my diligence was rewarded and, after about half a dozen sessions, I was in control of the camera and have enjoyed using it ever since. What’s more delving into the intricacies of this high end Sony camera has made it so much easier for me to help other folks understand and use their own Sony cameras. The photo at the top of this post was made in Hosier Lane in the city of Melbourne, Australia. Hosier Lane is a hub of activity for street artists and a very popular tourist attraction in its own right. Do You Want To Accurately Record Reality or Make A Great Photo? The photo at the very top of this post was made, hand-held, at 1/50 second at f/8. Due to the relatively low light level I set my camera to ISO 800. The resulting file was quite flat, so I employed Photoshop to considerably enhance texture, contrast and color saturation. In fact I’ve rarely pushed color saturation so far, but I think it’s appropriate to the nature of this form of street art and the fact that the work was relatively old and, as a consequence, had faded quite a bit over time. The process of photography has allowed me to bring it back to life. After all, why limit yourself to the notion of accurately recording reality when what you most want is a great photo. 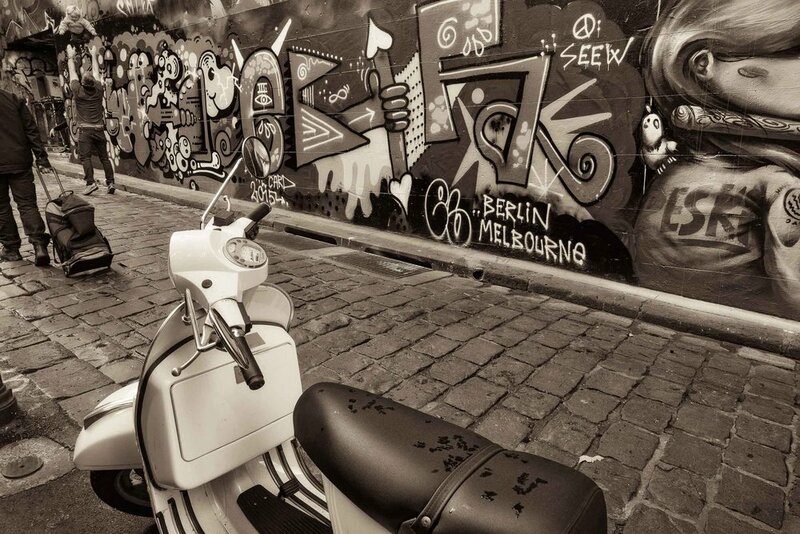 Three different modes of travel explored in the iconic Hosier Lane in Melbourne, Australia. 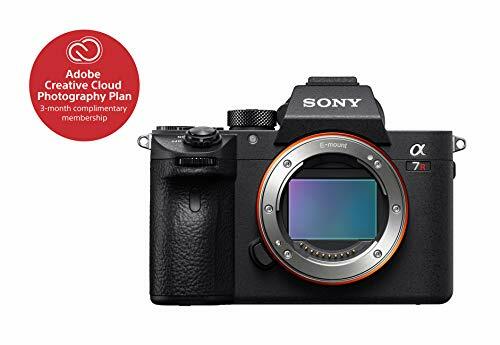 Being my first mirrorless camera I had to work hard to understand the Sony a7R II. But with a little practice new understandings and realizations quickly came my way. It was a revolutionary camera when I purchased it in 2015 and marked a significant evolution in mirrorless camera technology. The camera still performs admirably, though I’m probably now at the stage where I should consider upgrading to the current Sony a7R III camera. Travel, photography and education are the great passions of my life. It’s great, after all these years, to finally have a relatively compact camera system that I’m able to take onto planes, as carry on baggage, and carry into the landscape without too much difficulty. Here’s to travel, here’s to adventure and here’s to many thousands of photos with my Sony Mirrorless camera.